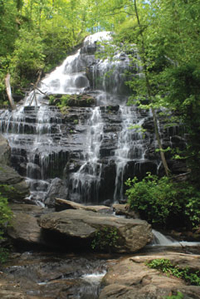 Thanks to the efforts of conservation-minded citizens, Oconee County's Stumphouse Mountain and Issaqueena Falls, once threatened with development, are now permanently protected. "Gorgeous, isn't it?" asks Frank Holleman as he looks out at the waterfall from the wooden viewing platform. The water glimmers in the springtime sun as it cascades down the steps of granite on its way along Cane Creek toward the city of Walhalla. "It's so representative of the wilds of the Blue Ridge Mountains." 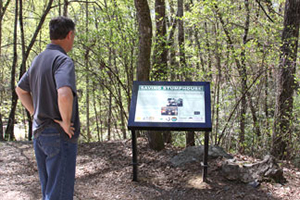 While visitors pose for photos in front of the falls, the Greenville attorney recounts a legend about how Stumphouse Mountain was named after a homestead cabin built by a pioneer and his Choctaw bride over the tops of stumps near the waterfall. When a group of Cherokee tried to seize the Indian princess, she escaped with her newborn baby and leapt over the precipice. According to the legend, she and the baby miraculously survived. 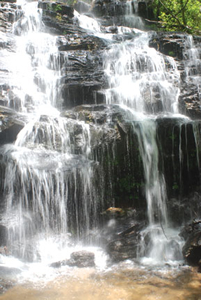 The Cherokee expressed their awe of her courage by naming the waterfall Issaqueena after her. With Holleman leading the way, we strike out for an abandoned railroad tunnel, hiking along a trail that a century-and-a-half ago was part of the Blue Ridge Railroad. 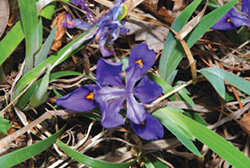 Holleman grew up in nearby Seneca and has spent enough time here in recent years to know where to point out plants such as Robin's plantain and various flowers that are starting to bloom. He praises the hard work of the Boy Scouts over the years to keep this trail passable. 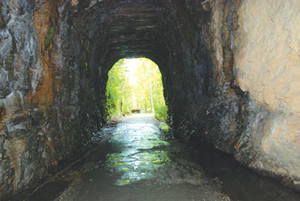 We stop at the entrance of "Middle Tunnel," and Holleman explains the history of the railroad, how the immigrant workers who created the tunnels in the 19th century populated Walhalla, and how many of their descendents still live in the area. Back at the parking lot, a steady stream of vehicles, several with out-of-state tags, keeps rolling in. College students, young families and retired couples explore the mountain on this bluebird day. Parents spread lunches on picnic tables while their kids run around, burning off pent-up energy and enjoying an outdoor opportunity that was almost lost four years ago. It took a monumental grassroots effort, led by local citizens, to preserve Stumphouse Mountain for future generations - one that energized an entire community of enthusiastic conservationists in the Upstate of South Carolina. "In January of 2007, I was sitting at my desk and my friend Bill Sharpton called me and said, 'Frank, you're not going to believe it, but Walhalla is preparing to sell Stumphouse Mountain,' " Holleman remembers. "So we jumped in the car and we came over. There were like seventy-five or a hundred people who had shown up." The citizens of this normally quiet mountain town who had assembled at city hall were angry and frustrated, many in a state of shock and disbelief, and all asking the same question: "Why?" The answer, perhaps unsurprisingly, boiled down to money. The city of Walhalla, like so many other small Southern towns, needed revenue. So they were considering selling the 450-acre watershed property on the mountain to a Florida developer who intended to turn the property into a 1,000-acre gated community (a private landowner had agreed to sell him an adjacent 500-plus-acre parcel). Stumphouse Mountain, the historic railroad tunnels, the waterfalls - all of the spots that were such an important part of local heritage - would be padlocked, and only those who could afford a luxury condominium would have an access key. Issaqueena Falls would be a water feature in somebody's backyard. Fortunately for the townspeople, before the deal could be finalized, local law required the city to hold a public hearing. J. Harold Thomas, a Walhalla builder, was one of those who spoke at that first meeting. "As a kid, I would hike up the waterline from Walhalla to the watershed," says Thomas. "There's a trail that went up the pipeline, so we used to hike up there and camp out, cook and eat and just enjoy it. I wanted that experience to be protected for all the other kids that come along in the future where they can do the same thing. I've got a great-grandson and he's only two years old, but I couldn't stand the thought of that being a gated community up there and him not being able to do the same things that I did." After the hearing, Holleman, Thomas and many other citizens of Walhalla and Oconee County gathered on the lawn of city hall and decided to take action. It was democracy in its purest form. They agreed to meet again in a couple of days at St. John's Lutheran Church in downtown Walhalla. "It was pretty phenomenal because it was so organic. The only way people knew about this meeting was through word of mouth and a few phone calls. 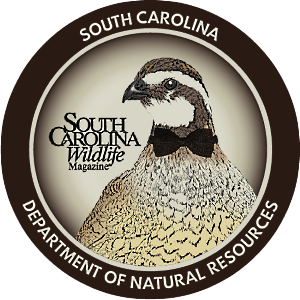 You didn't know who was going to show up or what was going to happen there," says Kristen Austin, the director of the Southern Blue Ridge Project for the South Carolina chapter of The Nature Conservancy. Austin was among those who attended the first meeting at the church. "Basically, it was just a bunch of concerned people who had come together to try and figure out what was going on and if there was anything they could do." After that initial meeting, the group began organizing in earnest. The consensus was that they were willing to do whatever it took to save Stumphouse Mountain, even if that meant raising enough money to purchase it. Tasks were divided up. Some volunteered to lead fundraising efforts, while others offered to work with the landowners. "Save Stumphouse" banners were created, protests and press conferences were planned, and the local media began broadcasting about the growing storm of events. 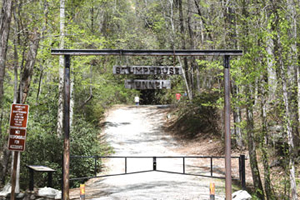 The volunteers started a petition that was eventually signed by 1,600 individuals who did not want Stumphouse Mountain turned into a gated community. At the next city council meeting, Thomas spoke to the council members and produced the petition, which contained more signatures from the citizens of Walhalla than had voted in the previous election - a point that Thomas made sure wasn't lost on the council members. Then, a wild card in the story developed - one that paved the way for the possibility of a different approach. An investigation turned up evidence, including a mug shot from a Ft. Lauderdale newspaper, that the developer proposing the Stumphouse deal was a convicted felon with a dubious business background. The developer backed out of the two contracts, creating a golden opportunity for negotiations with the city and the private landowners to keep Stumphouse Mountain a permanent public preserve. Volunteers of all stripes got involved with the preservation efforts. 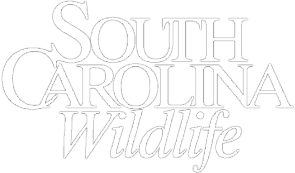 A diverse array of government and private nonprofit groups, including The Nature Conservancy, Upstate Forever, the S.C. Department of Natural Resources, Naturaland Trust, the South Carolina Conservation Bank, Clemson University, the Cherokee Bear Clan, Chattooga Conservancy, Oconee County, the Oconee Protection Group and the S.C. Department of Parks, Recreation and Tourism, all took part in fundraising and helping with paperwork. The volunteers at the core of the effort were able to call upon each group's particular strengths. "Not only did the citizens in that area work together, but all of the agencies, and particularly the nonprofits, just worked hand-in-glove, too," says Dana Leavitt, Land Trust Special Projects Director at Upstate Forever, "each of us defining roles that we would take on and going ahead and doing the best we could to carry them out. That was a beautiful effort." Some of the groups preferred to play a more behind-the-scenes role, including the DNR. "It would have been inappropriate for us to participate in any protests," says DNR Regional Wildlife Coordinator Tom Swayngham with a chuckle. "We were careful about getting involved because we're a government agency, and this was property owned by the city of Walhalla and some private individuals. We didn't want to come in and tell them what they ought to do, but we did want to try to support any protection efforts that came about. We wanted it to be privately driven, and we wanted it to be Oconee County driven." Which is pretty much just how it happened; The Nature Conservancy, Upstate Forever and Naturaland Trust worked closely with the other groups to raise funds. An anonymous donor pledged $300,000 if the volunteers could raise $600,000. "We had two ladies over in a retirement community send in two dollars so we could get the third dollar," Leavitt remembers. "There was a twelve-year-old girl from Pendleton that sent in fifty dollars that she was given for her birthday. It was just a great outpouring of support. Somebody asked me who gave the most and what was the biggest gift we got, and clearly the biggest gift we received was the time and energy of the folks that are from that community. They just came together to do their part tremendously well." Monty Hall would have been impressed with all the deals that were made. The private landowners agreed to swap their parcels so that the tracts containing the waterfall and the tunnels would be preserved. The city of Walhalla retained ownership of the watershed. They received $1.1 million for signing a conservation easement with Upstate Forever that will protect the tract from being developed, but still allow the city to manage the timber. 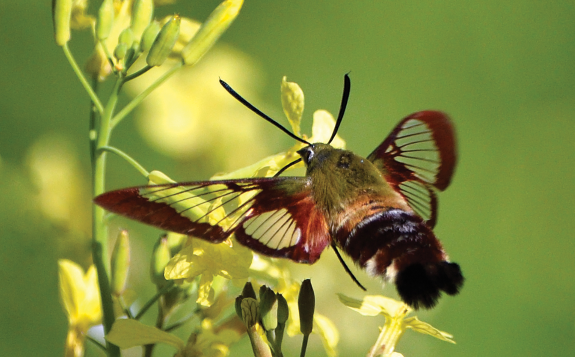 In six months, the conservationists raised $4.5 million. The DNR was then able to establish 442 acres as a Heritage Preserve. Essentially, almost 1,000 total acres were permanently preserved. 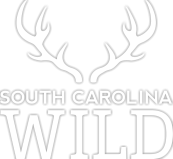 As an ecological bonus, the protected tracts connect two parcels of the Sumter National Forest, effectively creating a permanent wildlife corridor. Many of the locals involved in the Stumphouse preservation effort still work in conservation. 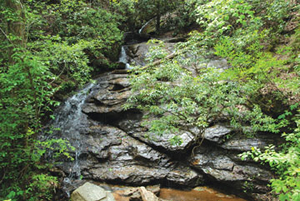 Volunteers, including J. Harold Thomas, created an organization called Oconee Forever - an offshoot of Upstate Forever - to spread the gospel of preserving private land in the mountains. They even have plans to create an Oconee County Conservation Bank. "I'm committed to conservation now," says Thomas. "There's plenty of room in Oconee County for housing developments, for industrial growth, for commercial activity, but the mountain area sort of stands out as a place we ought to preserve and not have anything to mar it." "I think what was so special about Stumphouse is that it was such a team effort. It was the coming together of people from all different corners to really make conservation happen," says Kristen Austin. "It helped people understand what conservation groups are able to do and that they can be a part of that effort. If conservation is going to succeed, private citizens have to be the driving force behind it." Stumphouse's main tunnel is impressive. Created with pick axes and dynamite, it measures seventeen feet wide and twenty-five feet tall, and at 5,863 feet, the tunnel would have been the world's longest if it had been completed. "This was where John C. Calhoun was going to win the Civil War before it happened," says Frank Holleman, pointing to the tunnel's entrance. "His theory was that if you could connect the South with the agricultural Midwest, you could outmaneuver the North." 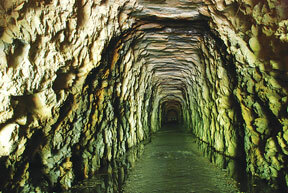 Today Stumphouse Tunnel offers visitors a unique look into South Carolina's past and a cool respite from hot spring and summertime weather. After we emerge from the dark tunnel, Holleman stops to reflect on what happened in Oconee County in 2007. "It's one of the most important events of my life," Holleman says. "It's one of those milestones in the lives of everybody, I think, who was involved in it. Nobody had any self interests. It was purely for the good of the greater community and to preserve the area's natural and historic heritage." Shannon Farlow is a freelance writer living in Asheboro, North Carolina.